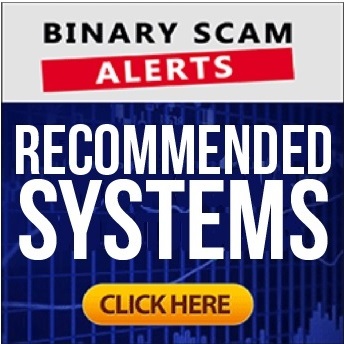 Binary Scam Alerts is posting an immediate review and SCAM notification in regards to the Azure Method software, app, and Auto-trader as well as Anthony (Tony) Azure the fake owner and cheater. The management and staff here is blacklisting this fraudulent app after receiving continued complaints from irate day-traders being relentlessly SPAMMED by unscrupulous marketers attempting to lure them into what is a confirmed binary options investment scam. Our extensive review and investigation into this scheme painted a very disturbing picture whereby innocent victims are being targeted and intentionally mislead as well as deceived by professional con-artists. First and foremost this software is promising no losses. This is more than insulting, it’s downright infuriating and you should get very upset when you see this type of false advertising. There is no such thing as zero losses and anyone trying to sell you these lies deserves to be out of business. Additionally, there are some conflicting statements here. 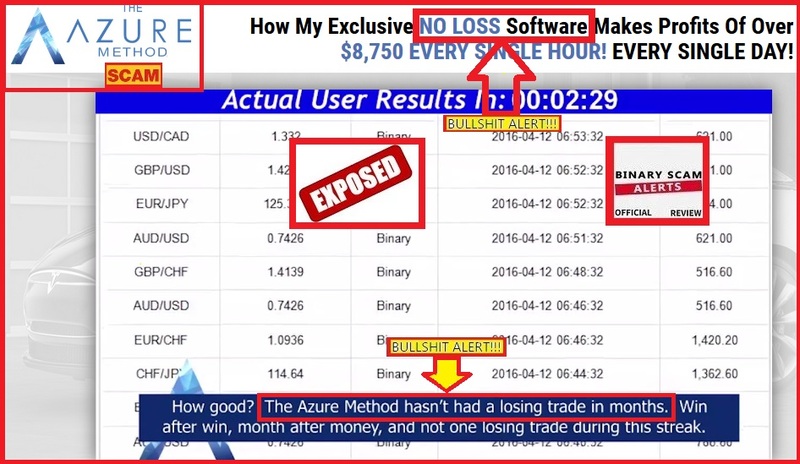 At the top they say No Loss, but below it mentions “the azure method hasn’t had a losing trade in months”. Well, if it sounds confusing its because these guys went too far and apparently got lost in their own web of lies and deception. As if you needed more proof, the image below illustrates the so called beta-testers who received checks based on their profits using the system. This is a complete fabrication since the money is sent directly from your broker’s bank account and has nothing to do with the software you are using. This simply corroborates the evidence and creates a broader base of evidence which is growing by the minute. Additionally, all these people are actors, and the testimonials are fake and stolen from the internet without written consent or ripped off from image banks as you can see in the image above. In this case it is a rehashed image from the Citidel Ltd Scam. The Azure Method is reminiscent of the Drexel Code Scam and uses the same elements to deceive potential customers. Granted, this is a very high-end production which uses a yacht, multiple actors, and rented office space. All of this is used as a proverbial fig leaf to hide the lie and SCAM. We are not impressed by window dressing and misdirection, we are however searching for the facts, and what have found is fallacious and falsified information. The use of inflated bank accounts is used excessively, and in the most misleading way. There is no actual way to see where the money originated from, or if it was a result of actual winning trades produced by the system. We keep hearing the same stories about having a limited slot for select beta-testers willing to “take action”. “Would more than two million dollars in your bank account change your life? I know it would.” Whenever someone starts talking to you like this, you can probably bet your bottom dollar he is trying to sell you something and you must proceed with extreme caution. It’s also very important to note that on the second page when you sign up it is for the broker and NOT the software. This is done by design to get your guard down and let you think you are signing up for something which is free, when in fact the truth is exactly the opposite. So you will not need any form of trading tools that will help you achieve the desired ~85% win ratio. Candle Sticks, bolinger Bands, Momentum trading, and scalping on 60 second options will not assist you in the least bit. You must realize you entered a trap and quickly think of an exit strategy and the best way to collect whatever is left of your money. Not really no. You will have to part with a minimal investment amount of $250 and it will be paid through their recommended broker. These include but are not restricted to: Amissio Formula, Millionaire Blueprint, Google Trader, The Free Money System with Walter Green, The Lie Detector Millionaire, Profits Infinity, Regal Wealth, Cloud Trader, and the Push Money App with Dennis Moreland. We receive about 10 endorsement requests each day, but almost all of them are rejected because they don’t pass our rigorous credibility test. These systems must show a high level of transparency, accuracy, and professional customer service. Only the best systems are prominently displayed in our recommended software section. 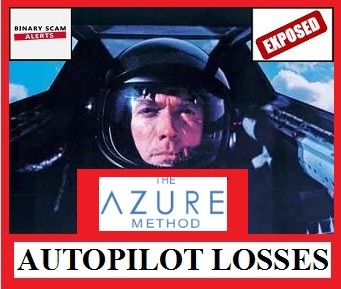 The Azure Method software, app, and Auto-trader as well as Anthony (Tony) Azure is a confirmed binary options investment scam as has been proven in this review. There is nothing about this software which is genuine, legit, or sincere and it will steal your money and that is a 100% guarantee. Join our Facebook Group and YouTube Channel to get informed.